I've been making it a mission of mine lately to take better care of my skin. For a while now I've been tackling the odd outbreak of hormonal acne on my chinny chin chin (such fun) and its made me revise my skincare routine. I have to admit I have been guilty in the past of just using a face wipe to remove my make up, probably far more often than I should! I wanted a brand that would be kind on my aggravated skin and that was also cruelty free- Yes To seemed like a good option. I've never tried anything from this brand before despite hearing lots of positives so I picked up a couple of things. 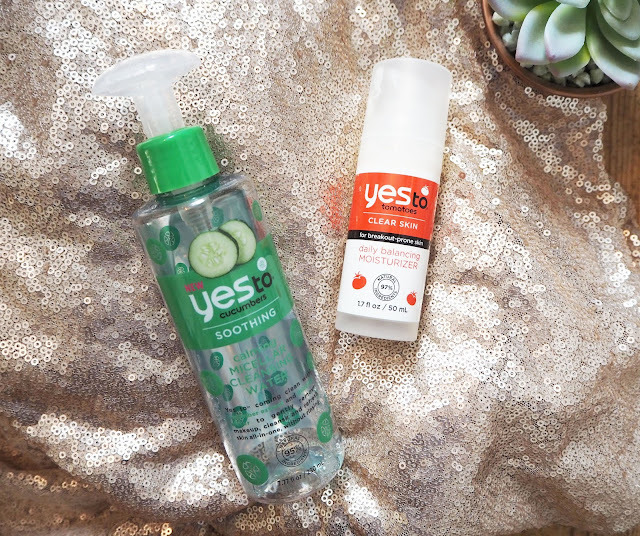 Yes To do several ranges aimed at different skin types, I went for the Yes To Cucumbers Calming Micellar Cleansing Water and the Yes To Tomatoes Daily Balancing Moisturiser but in all honesty there was so much I could have bought as it all looked great. I've been using both for several weeks. The Yes To Cucumbers Calming Micellar Cleansing Water (£6.99) claims to 'gently remove make up, cleanse and refresh skin all-in-one, without rinsing' which I guess is the whole point of the wonder product that is micellar water (what did we do before they existed?). The packaging also says it contains 95% natural ingredients and is 'formulated without parabens, SLS and silicones'. I like the sound of 'natural' skincare though I still don't recognise the name of lots of the ingredients, thats probably something I need to brush up on. As you've probably guessed this micellar water has a refreshing, cucumber scent which I like but I know lots of people aren't keen on scented skincare so if you fall into that camp then give this one a miss. It has a pump dispenser which I love as you have more control over how much product you are using, around three pumps seem to do the trick for my entire face and eyes. Depending on my eye make up I do sometimes have to then go in with a stronger eye make up remover but that doesn't bother me too much. finish it up but I'm not sure I would repurchase right away. Overall, I've been enjoying exploring a new brand and am keen to get some other bits from Yes To, if you've got any recommendations then please leave them below. Also, if you have any tips on dealing with hormonal acne then pop them in the comments too!